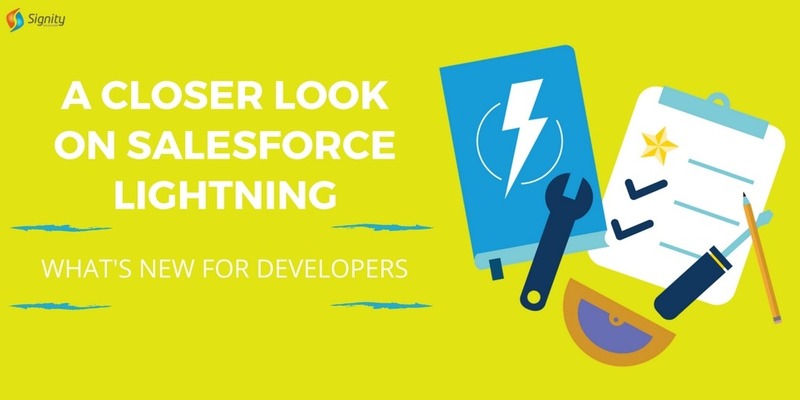 A Closer Look on Salesforce Lightning: What’s New for Developers? Salesforce – the name in itself is enough to entice the interest of someone involved in the IT and Tech industry. Salesforce CRM has made quite an impact in the industry, capturing approximately 20% share of this $26 billion industry. The previous year was the year when this CRM giant acquired a number of companies which worked on AI and machine-based learning. And, the spring release proved how important these acquisitions were! With the addition of features like Einstein Vision, the new image recognition technology in the CRM, Salesforce has given the developers something they can use to create amazing AI-powered apps. Plus, the image recognition technology can serve as a great addition to understand customer behavior and provide and better-than-ever customer service experience! Another major highlight of the release has been the new Automated Activity Capture that Salesforce Lightning experience has brought forward. The feature allows you and your team to quickly get a look at all the interactions with a client right here with Salesforce. So you will no longer need to juggle between multiple apps like Office 365 or Google to get access to the information you want to see. As a matter of fact, a Kanban view has also been incorporated in the CRM to help you manage team processes seamlessly. With the rise of remote teams and flexible work culture, collaboration has become the mantra for success for every business. While Salesforce already had quite a number of handy features for collaboration, with their new release they have gone a step ahead and incorporated something that lets you collaborate over documents new. So, now you get QUIP, a document management system that you can use to create documents, link them and share them within Salesforce itself! It will work like your personal Google Docs but within the Salesforce now. To help your team leverage their marketing endeavors to the fullest, Salesforce has brought forward KRUX. It is a data management system that allows you to capture customer data from sources like Mobile, CRM, and even Commerce. The data can then be used for quick analysis extending the virtually endless possibilities of marketing cloud. So now you will be able to create more relevant and targeted advertising campaigns, more personalized content and better the overall customer service experience! Apart from these major highlights the other praiseworthy inclusions in the Spring ’17 Launch of include features like Salesforce Live Message, which allows you to stay connected with work and communicate via FB messenger, SMS, and other popular messaging apps. There you have it – some of the most awesome features that Salesforce has brought for the developers as a Spring Surprise this year. If you have not migrated yet, then it is to go ahead with the migration and make the most of these features! In case you are looking for assistance across the Salesforce platform or want to explore its Lightning component for development, customization or implementation, you can just drop us a line at sales@signitysolutions.com, and we will be happy to help.